Peter Butterworth is specified as the websites creator. The web server used by Ourcoffeeshop.co.uk is located near the city of Burlington, USA and is run by The Endurance International Group. There are many websites run by this web server. The operator uses this server for many hosting clients. In total there are at least 112 websites on this server. The language of these websites is mostly english. Only a few websites on this web server are x-rated. 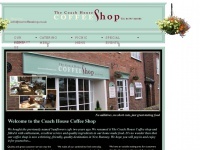 The websites of Ourcoffeeshop.co.uk are hosted by a Microsoft-IIS server and were developed in the programming language ASP.NET. The markup language of the website is XHTML 1.0 Transitional. The visitor analysis software Google Analytics is used to analyze the visitors of the websites. Both the inclusion of the website in search engines and follwoing of its hyperlinks is explicitly allowed.